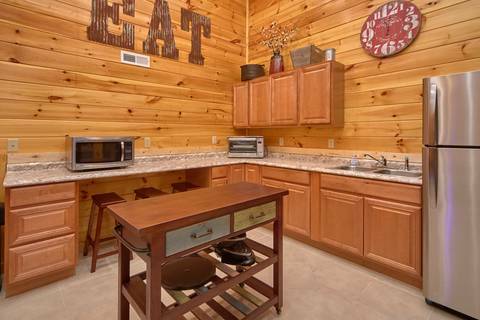 TOP NOTCH LODGE is just that..... TOP NOTCH! This is not just a night's stay, it is truly an experience. Perfect for families, church groups, corporate retreats or weddings! 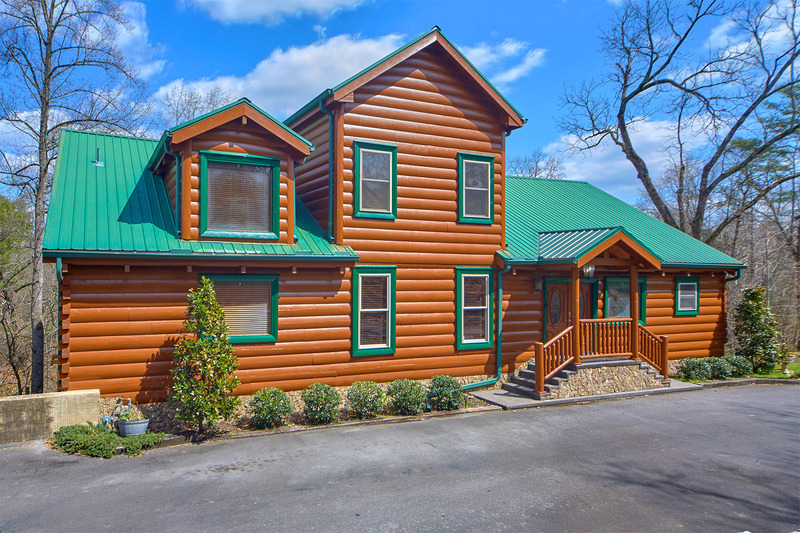 SPECIAL NOTE: Because of the location of this cabin please know it will be faster and better for you to utilize our Express Check-In. This allows you to avoid backtracking through the busy traffic we have at times. MAIN ENTRY LEVEL: Walk up 5 steps and enter in the cabins main level. You will experience that "Wow!" moment from the actual size of this beautiful cabin. A completely furnished kitchen will greet you, complete with commercial appliances. Both gas and electric range and stove tops, 2 huge refrigerator/freezers, custom granite counter tops and plenty of bar seating area. 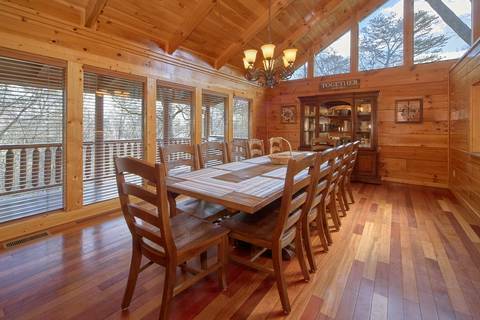 There are 2 large family dining tables to enjoy those wonderful meals with your family or friends! 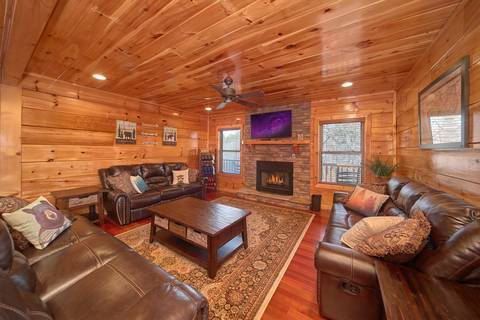 There is a living room area on this level, with 3 recliner couches, a gas fireplace (seasonal) and a large flat screen TV. 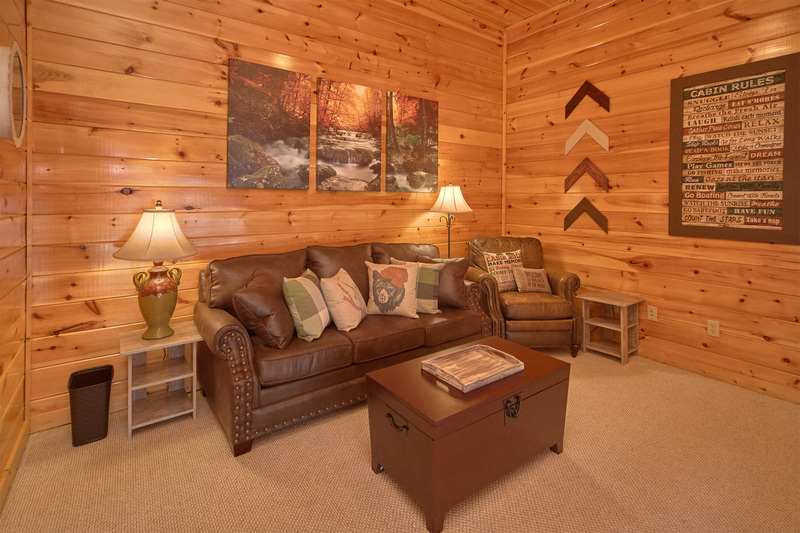 2 Bedrooms on the main level are very nicely decorated. 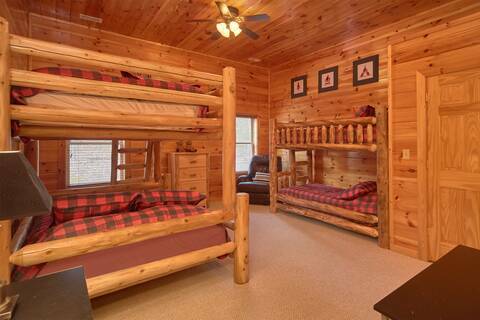 A King bed and a full bathroom will sleep 2 people. The master bedroom suite is a one-of-a-kind that will so glad that you chose to stay at Top Notch Lodge. 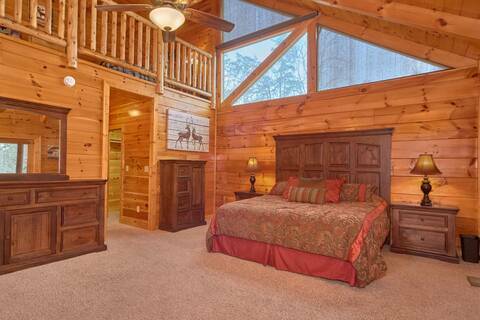 A King bed in a huge bedroom will greet you with a large loft with 2 full sized beds towers overhead. A walk-in closet is located right across the hall from a private "kids" bedroom with a twin bed. 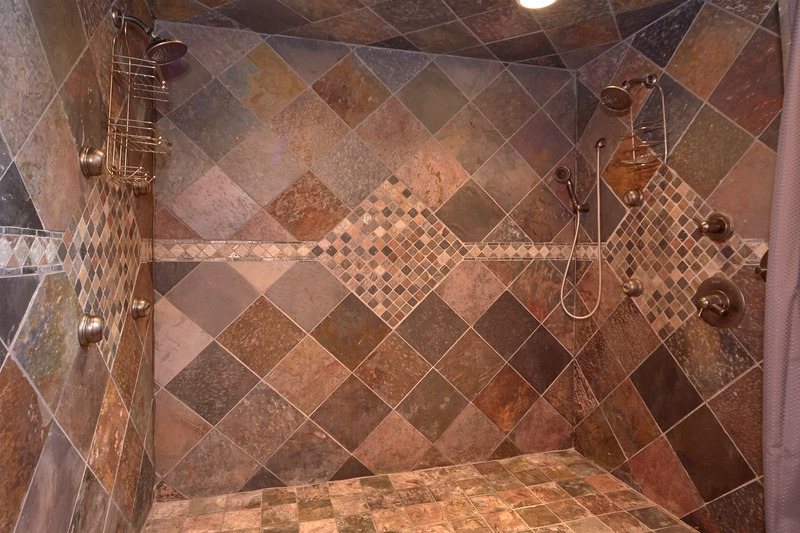 The master bath features a double jetted stone shower, 2 vanities and a jacuzzi tub. 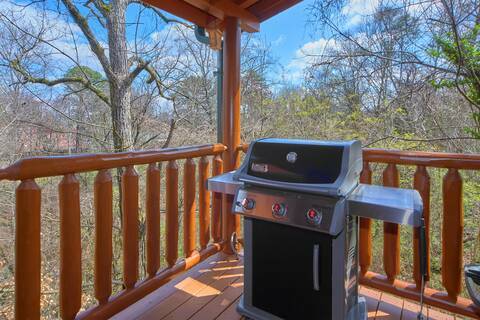 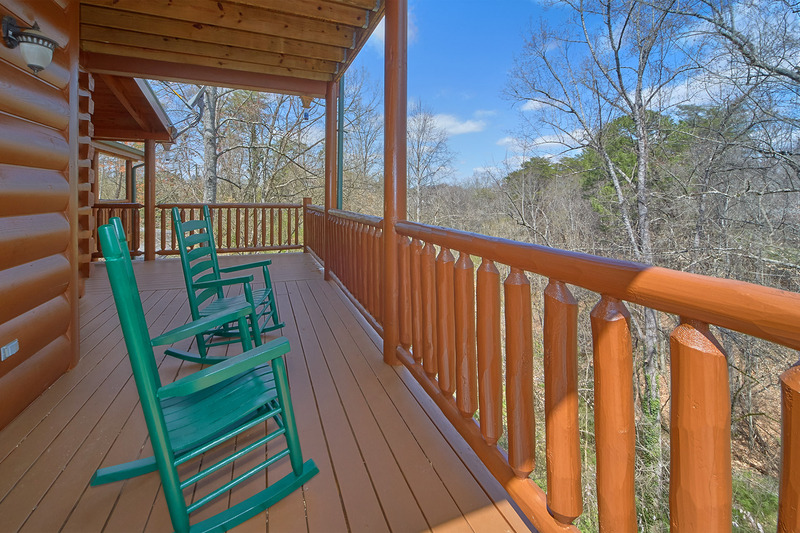 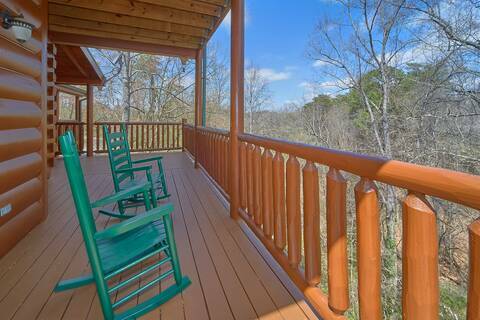 The suite also has private access to a large covered porch with rocking chairs and a gas grill. 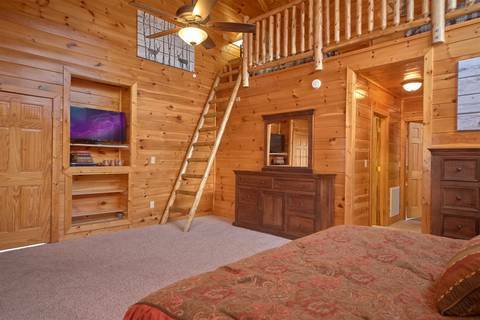 UPSTAIRS LEVEL: At the top of the stairway there is a great reading/relaxing area that overlooks the living room and kitchen. 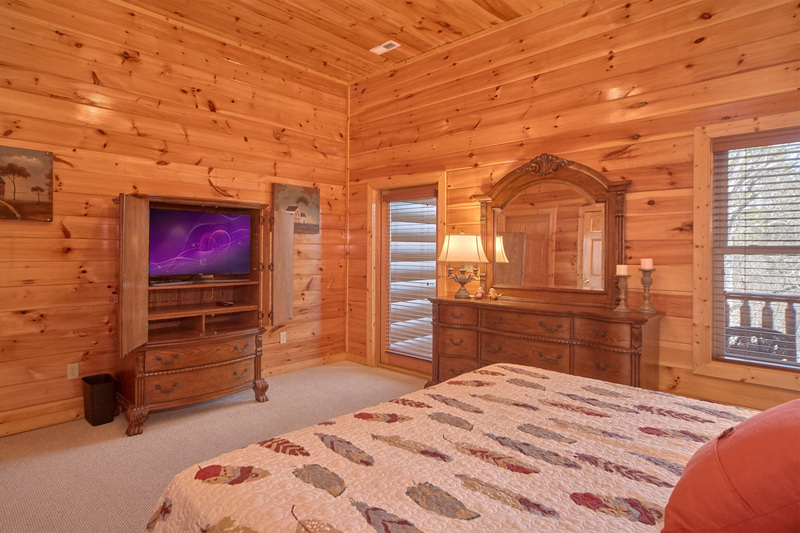 A sleeper sofa is in the center of this room with bedrooms on either side. The first bedroom will sleep 6 people on a set of queen-size bunk beds and a set of twin size bunks. The second bedroom is equipped with a king size bed and it's own private balcony with rocking chairs. Each bedroom on this level has its own private full bathroom with a jetted jacuzzi tub. 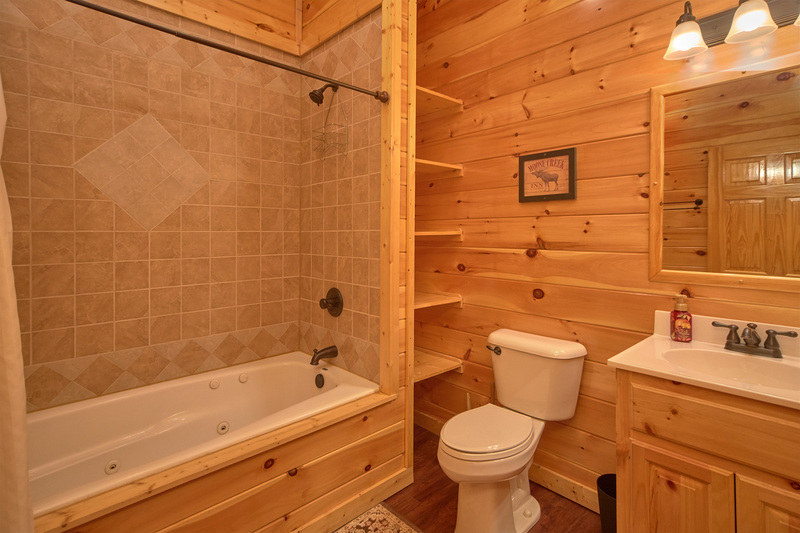 LOWER LEVEL: The lower level of this cabin is where all of the fun happens! 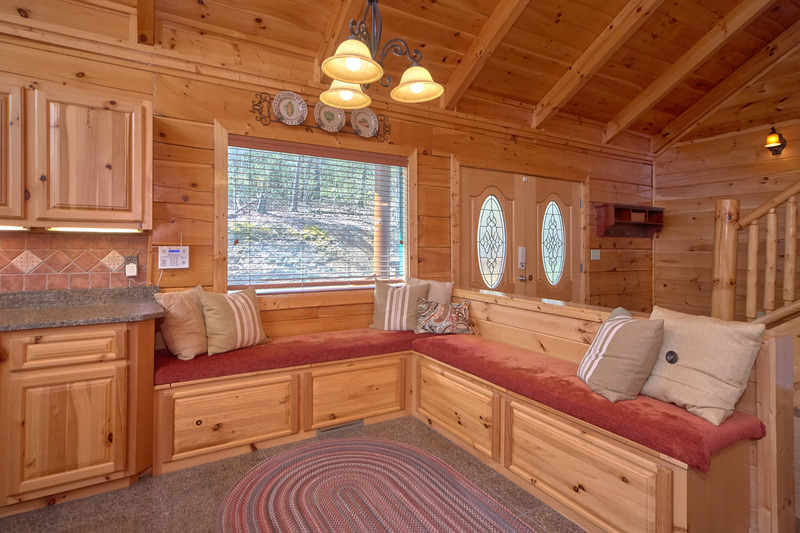 At the bottom of the stairway you are greeted by another small kitchenette with granite counters, a counter top convection oven, microwave and a small refrigerator. 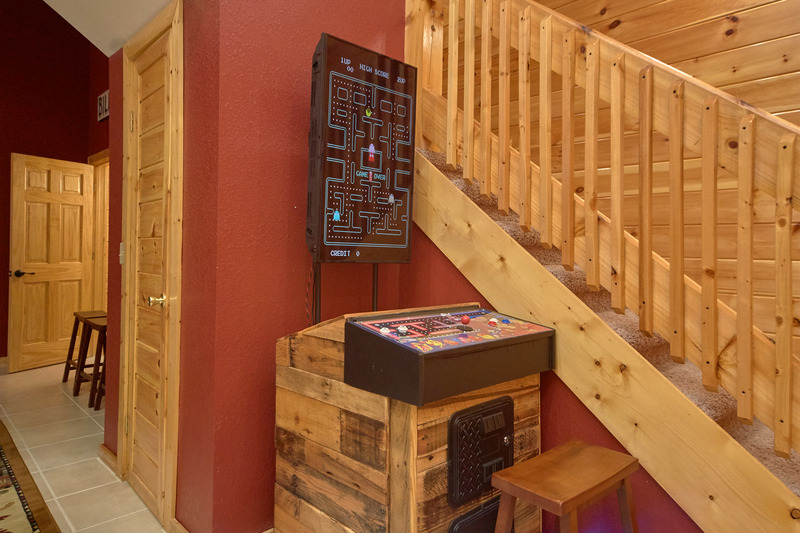 An awesome upright multicade game features 60 of your favorite 1980 arcade games including Pac-man, Ms. Pac-man and Donkey Kong! 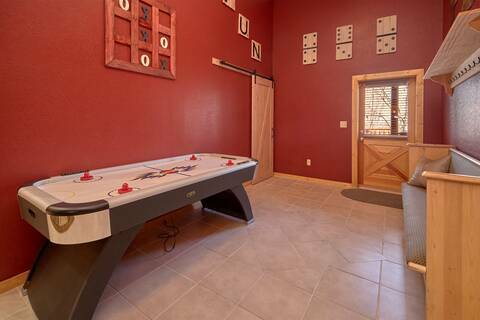 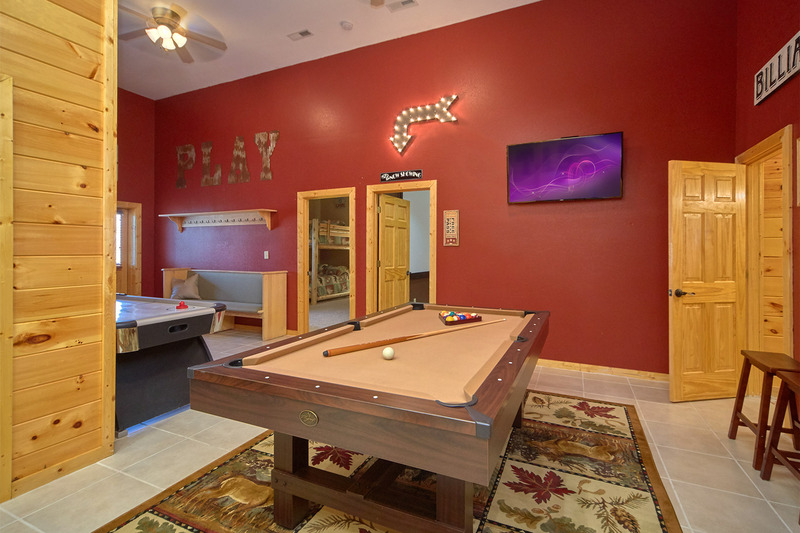 A beautiful pool table and a fun air hockey table are in the entertainment area as well. 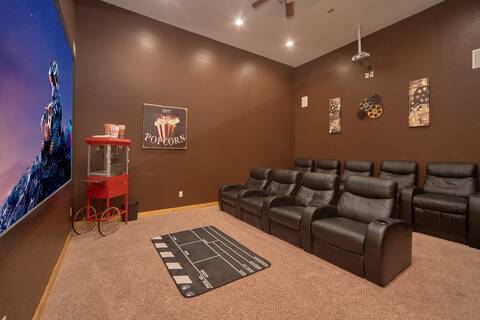 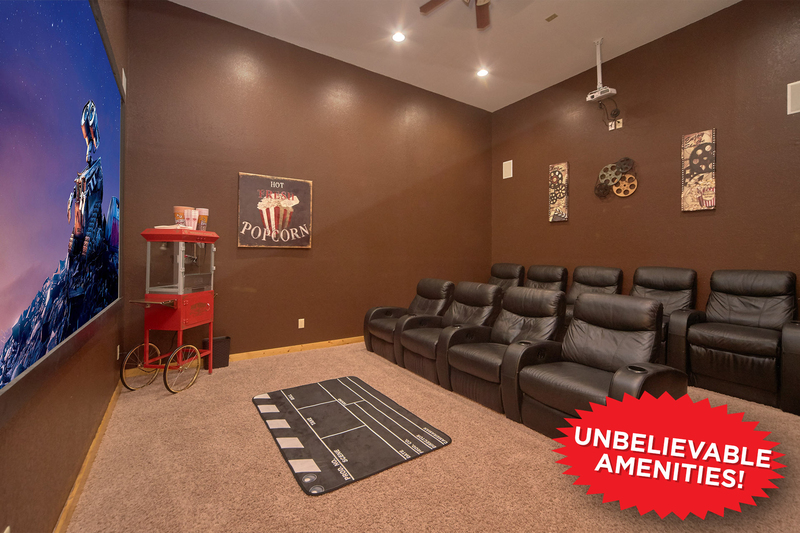 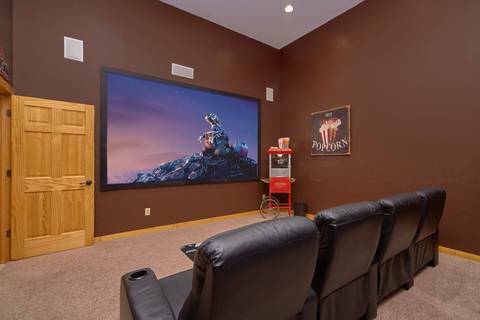 A full, luxurious theater room, complete with your very own popcorn machine awaits your group for that memorable "movie night" experience! 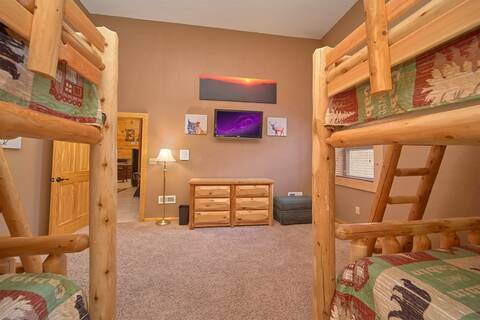 There are 2 bedrooms on this level. 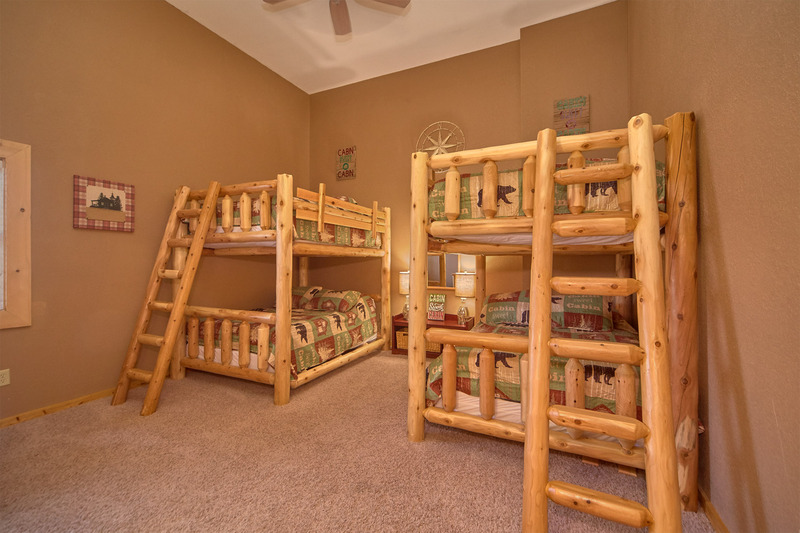 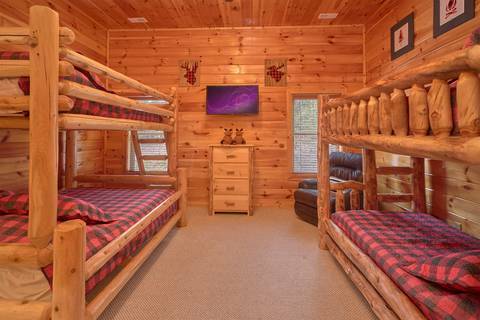 A large room with 2 sets of queen-size bunk beds and another with one set of queen-size bunks. 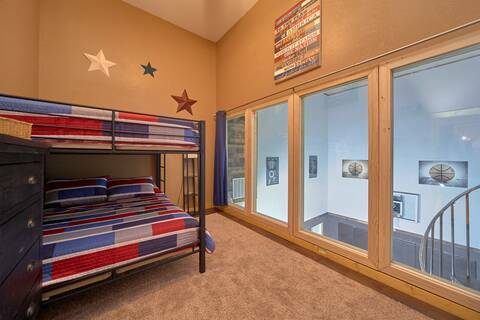 This bedroom overlooks your very own INDOOR BASKETBALL COURT! 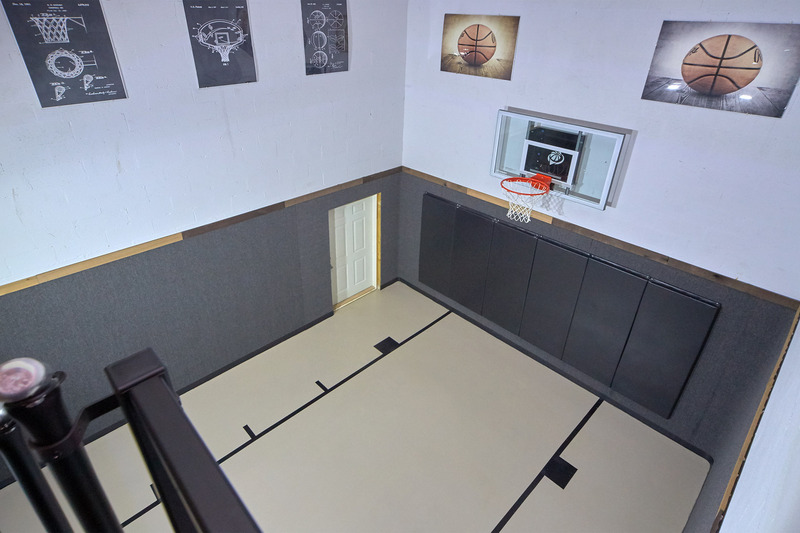 That's right, INDOOR BASKETBALL COURT! 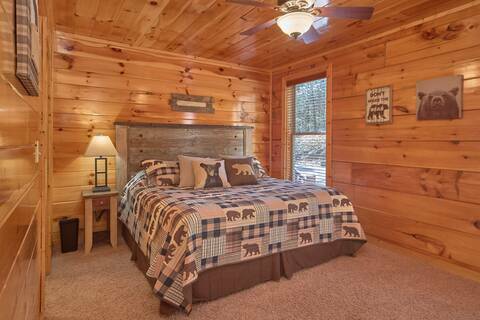 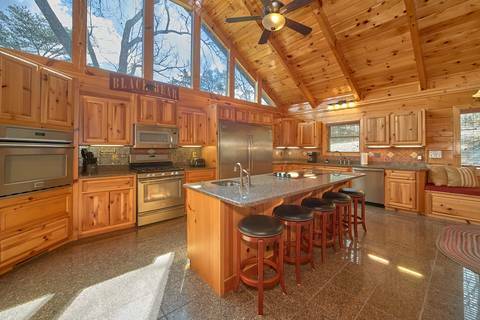 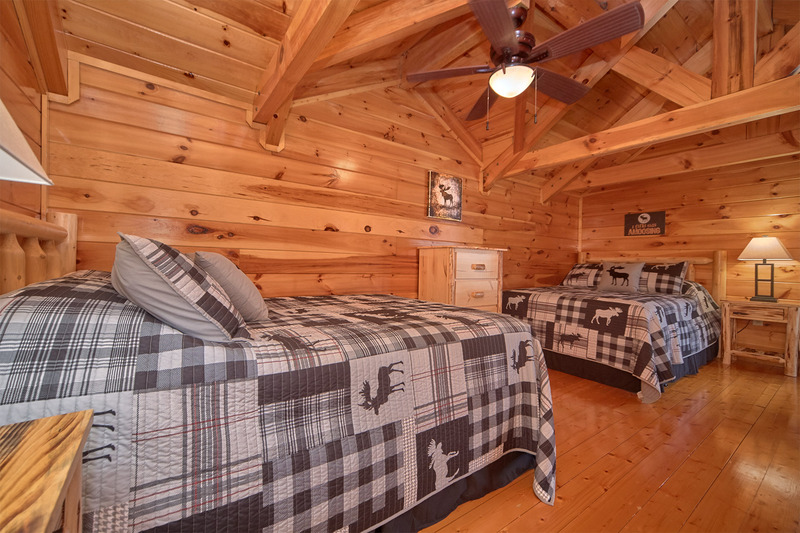 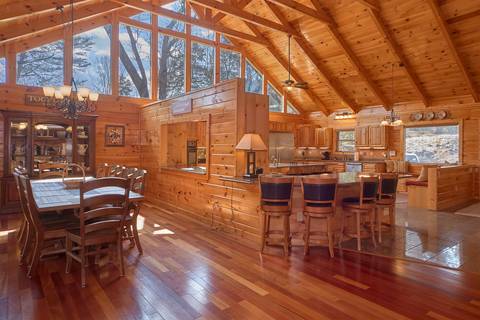 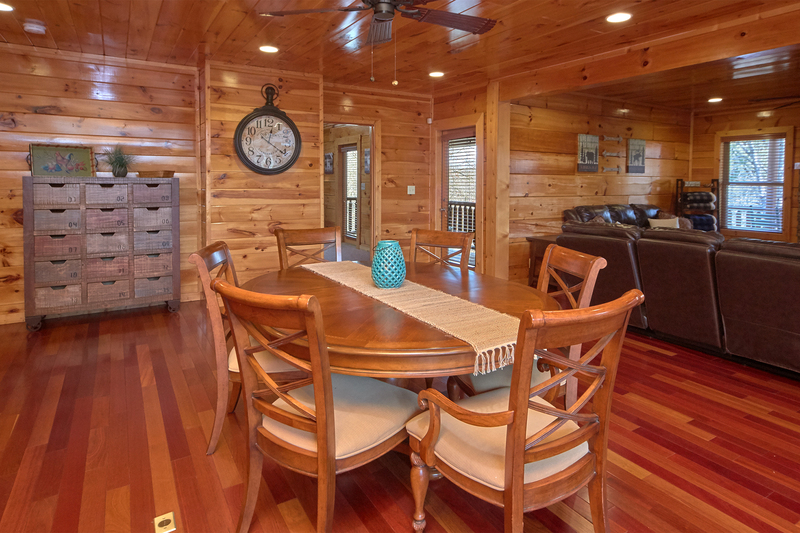 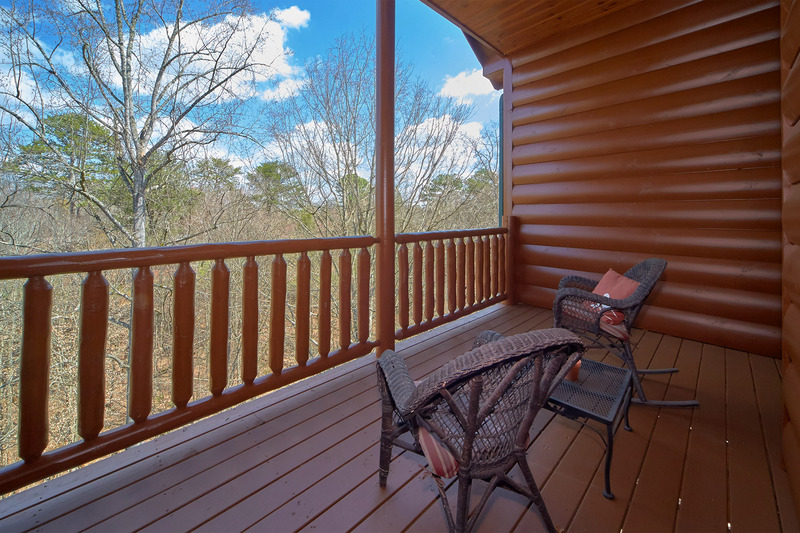 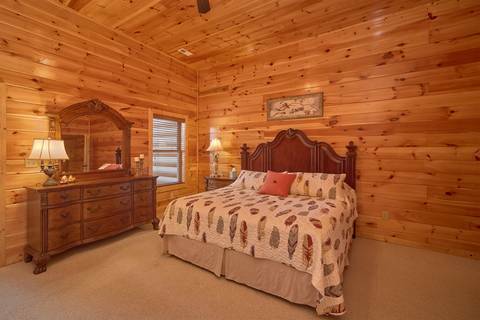 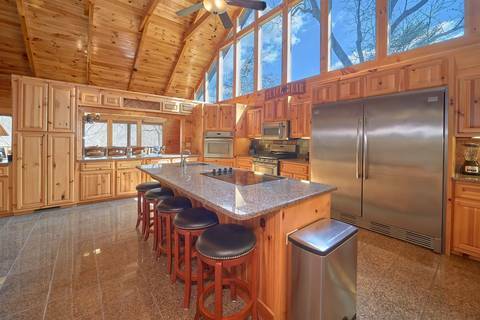 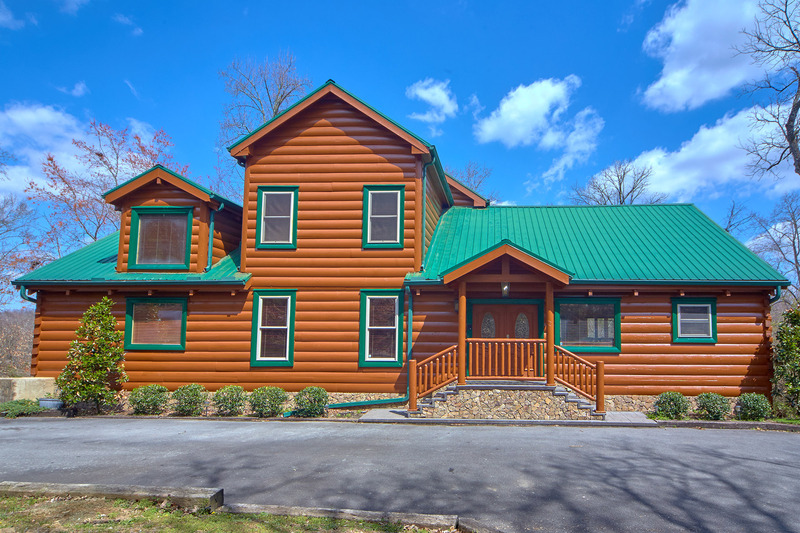 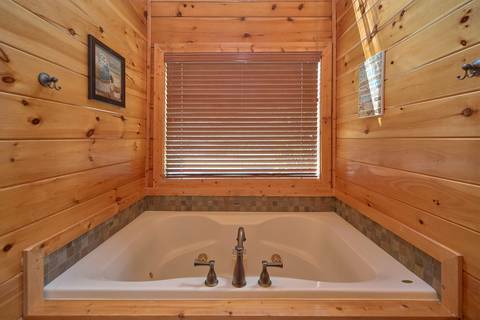 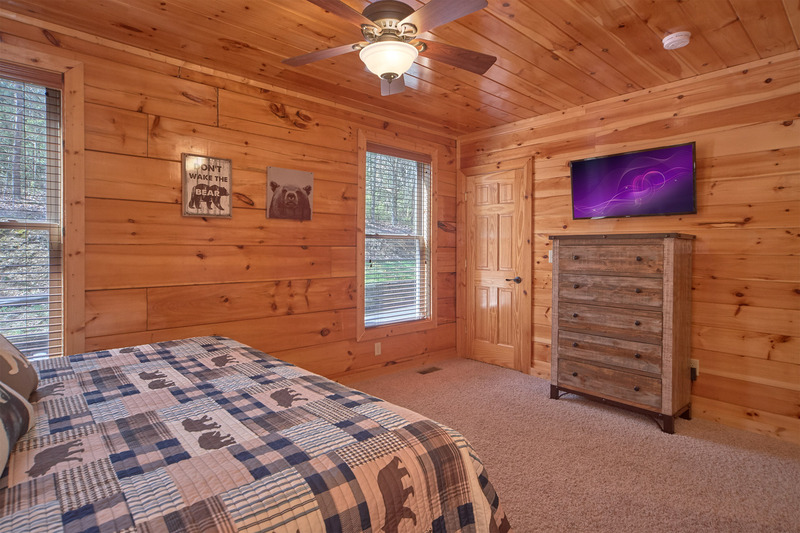 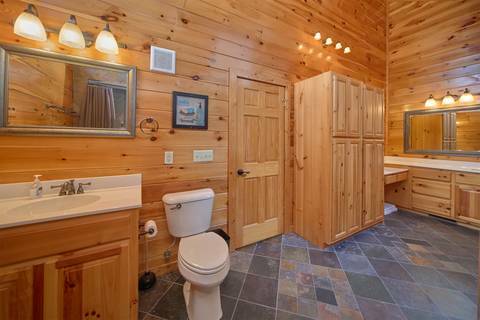 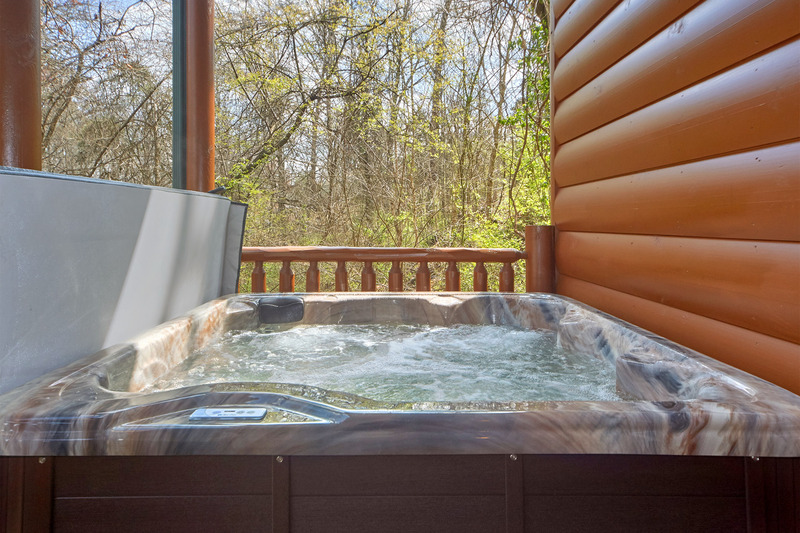 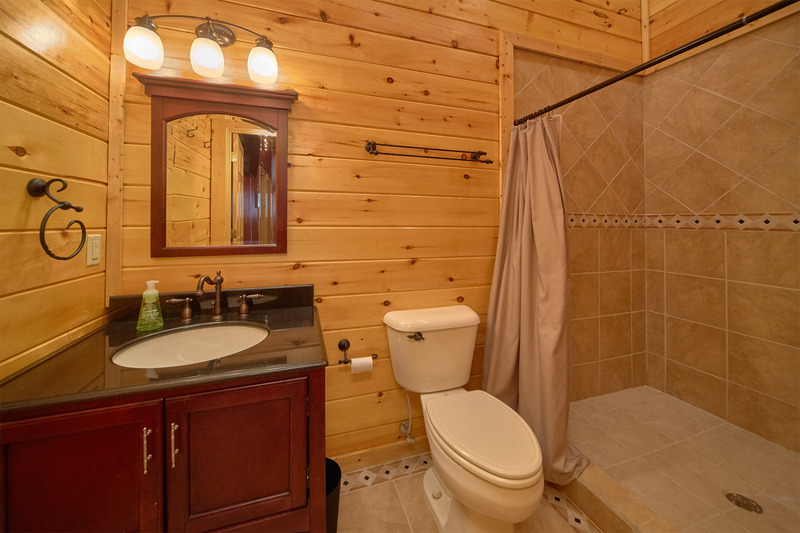 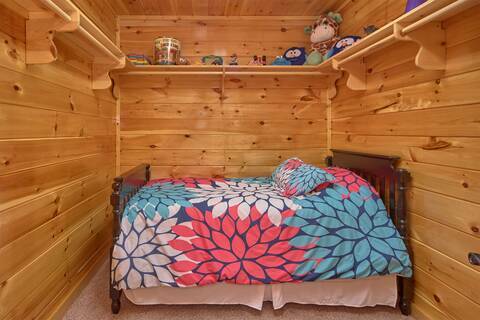 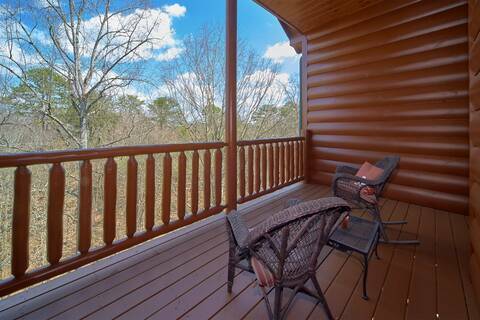 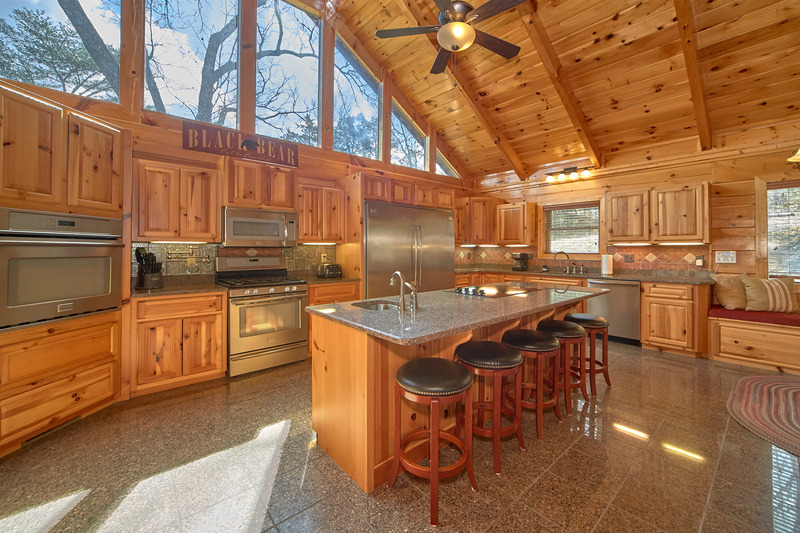 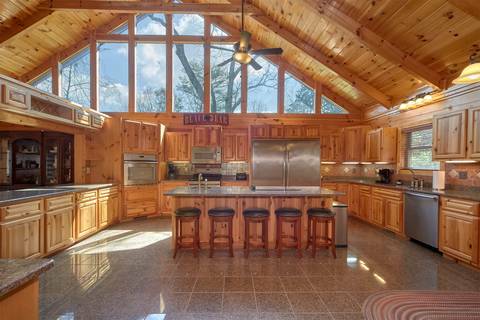 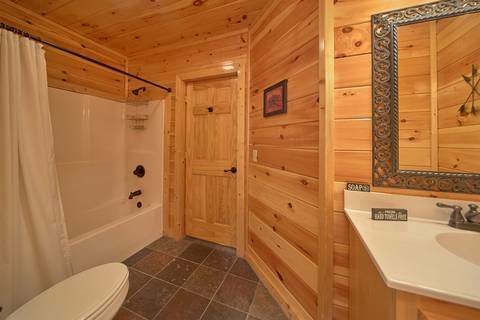 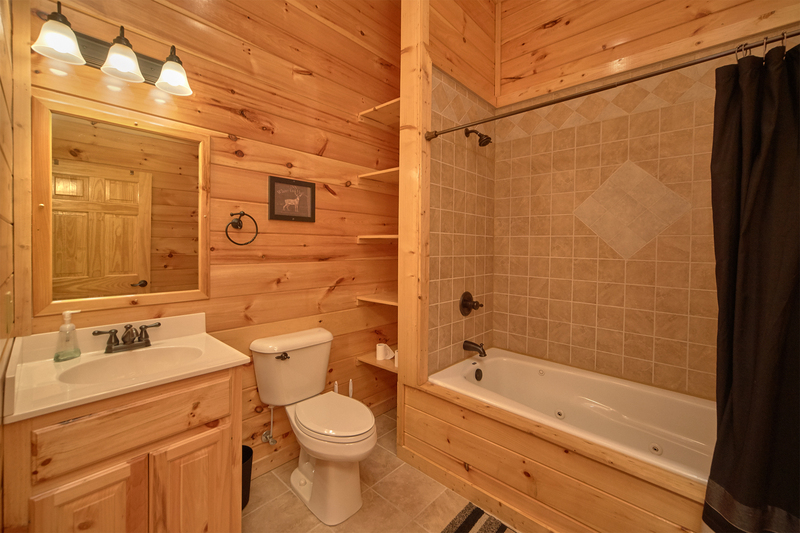 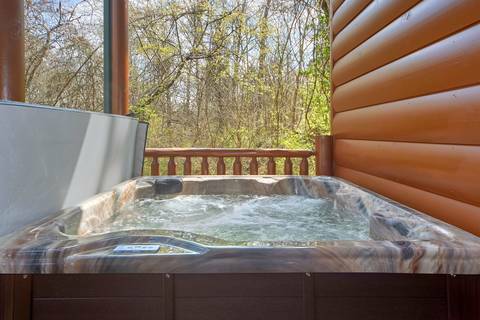 Call us or book online to enjoy this gorgeous cabin today!